Stout perennial 1.20-2.50m tall, native to noerthern Europe and Northwest Asia; leaves biternate, the lower leaves sometimes 30-90 cm long; segments oval, unevenly toothed or cut, terminal segments usually 3-lobed; umbels 8-15 cm across, with 20-40 rays; umbellets subtended by many linear bractlets. A.archangelica extracts are used extensively in the liquor industry as a flavoring in liquor such as boonekamp, benedictine, and chartreuse. Angelica root oil contains a small fraction of musk-smelling macrolides. In this fraction the ω-alkanolides C13 (50.0%), C14 (0.5%), C15 (42.0%, Exaltolide®), C16 (trace), and C17 (3-5%) as well as 12-methyl-13-tridecanolide (4.0%) were identified. 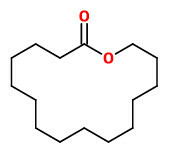 The enantiomeric composition was found to be 72.4 % (12R)-(+)-12-methyl-13-tridecanolide (musky, sandalwood, pear) and 27.6 % (12S)-(-)-12-methyl-13-tridecanolide (musky, animalic, camphor). 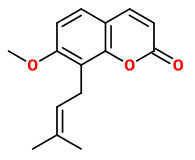 Imperatorin is the most abundant furanocoumarin in the ethanolic seed extract of A.archangelica, comprising 40-50% of its total furanocoumarin content. 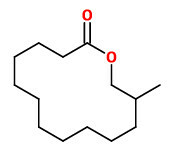 Xanthotoxin is the second most abundant in the reaction mixture in the assay of the seed extract. The Acetylcholinesterase activity of imperatorin and xanthotoxin from A. archangelica was measured, and xanthotoxin proved much more potent than imperatorin… However, furanocoumarins seem to have a minor part in the total activity of this extract. Synergistic interaction was observed between the extracts of A. archangelica and G. sylvaticum. Osthole may be (partly) responsible for the antispasmodic effect of A.archangelica, as it is also responsible for the relaxant effect on the rat ileum as a component of Prangos ferulacea.